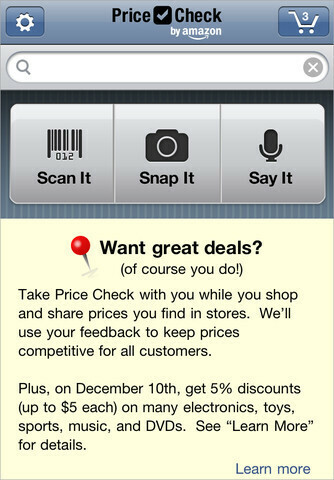 Simply installing Amazon's Price Check app and using it to scan a product at a brick and mortar store before you eventually buy it from the online retailer, can help you get up to a $5 discount on the purchase. That sounds like a decent discount for doing nothing but using your smartphone to press on some buttons. But as usual, there is no such thing as a free lunch and there are some requirements. Not every product is available to receive the discount and for those that do qualify, the most that you will be able to take off the price is $5. But that could turn out to be a decent amount of money that stays in your pocket. After all, Amazon usually has a lower price than a brick and mortar store, doesn't charge tax in some states and shipping is free. Taking $5 off an already low price is going to feel like Christmas in July December. 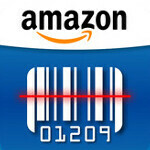 The Price Check app can be downloaded from the Android Market, Amazon's AppStore or the Apple App Store. This Saturday, December 10th, head over to a store that carries the product you are looking to buy and scan the barcode so that the app can compare the price of the product between the store and Amazon. If the purchase is for a product that qualifies for the discount, the price comparison will include a 5% discount on Amazon's price, up to $5 off. Oh yes, you are limited to taking the discount no more than 3 times on one day. Still, it can't be any easier for you to save some bucks while shopping.